The highly anticipated horror film Murder In The Woods, starring José Julián (A Better Life) and featuring renowned actor Danny Trejo (Machete), had its world premiere on Nov. 4 at the 7th Annual Guadalajara International Film Festival in Los Angeles (FICG in LA), one of the most important and prestigious film festivals in Latin America. The movie is on its way to a few more prestigious film festivals throughout the US. 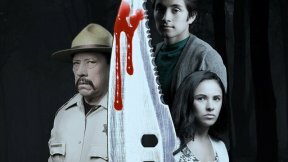 Murder In The Woods distinguishes itself as being an All-American horror film in English, with an all-Latino cast, created by Latinos for Latinos with a universal story. The plot of the film develops as a group of teens plan to spend a weekend in a cabin in the woods, but soon strange things begin to happen as disturbing omens arise. When they discover the dark secret that the cabin holds, their forced to fight for their lives. The movie incorporates Mexican myths like the chupacabra, La Llorona and others.